Mt. 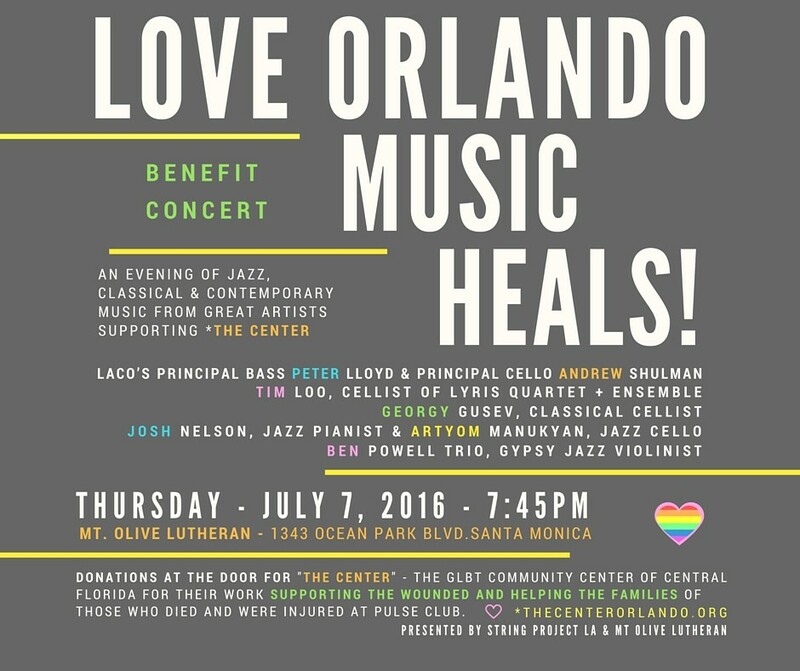 Olive Lutheran Church Santa Monica and the String Project Los Angeles are proud to announce “Love Orlando, Music Heals,” an evening of jazz, classical and contemporary music from great artists to support “The Center” in Orlando, Florida, on Thursday, July 7 beginning at 7:45pm at Mt. Olive, 1343 Ocean Park Boulevard, Santa Monica. Click to enlarge image. 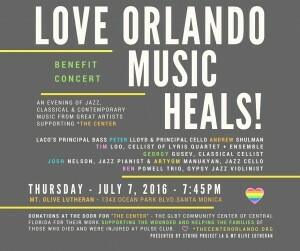 Donations at the door will benefit “The Center,” the LGBT Community Center of Central Florida for their work supporting the wounded and helping the families of those who died and were injured in the shooting at the Pulse Club on June 12. Mt. Olive Lutheran Church is a “Reconciling in Christ” congregation, that is, a congregation that welcomes everyone, including Gay and Lesbian people. The congregation has a large parking lot and is handicapped accessible. For more information, contact the Rev. Eric C. Shafer @ pastor@mtolivelutheranchurch.org or 310-452-1116 (office) or 267-222-0964 (cell).